2014 (MMXIV) will be a common year starting on Wednesday of the Gregorian calendar, the 2014th year of the Common Era (CE) and Anno Domini (AD) designations, the 14th year of the 3rd millennium, the 14th year of the 21st century, and the 5th year of the 2010s decade. New Year’s is a harmless annual institution, of no particular use to anybody save as a scapegoat for promiscuous drunks, and friendly calls, and humbug resolutions, and we wish you to enjoy it with a looseness suited to the greatness of the occasion. Year 1914 (MCMXIV) was a common year starting on Thursday in the Gregorian calendar and a common year starting on Wednesday in the Julian calendar. It was the year that saw the beginning of what became known as World War I.
Latvia will officially adopt the euro currency and will become the eighteenth Eurozone country. The 2014 Winter Olympics will be held in Sochi, Russia. Year 1814 (MDCCCXIV) was a common year starting on Saturday of the Gregorian calendar and a common year starting on Thursday of the 12-day slower Julian calendar. Comet Holmes (17P/Holmes) will reach perihelion. An annular solar eclipse will occur. Year 1714 (MDCCXIV) was a common year starting on Monday of the Gregorian calendar and a common year starting on Thursday of the 11-day slower Julian calendar. Now is the accepted time to make your regular annual good resolutions. Faye’s Comet will reach perihelion. Year 1614 (MDCXIV) was a common year starting on Wednesday of the Gregorian calendar and a common year starting on Saturday of the 10-day slower Julian calendar. The 2014 FIFA World Cup will be held in Brazil. The Sky City skyscraper is planned for completion in Changsha, Hunan, China. And try to be wise if I cannot be good. Year 1514 (MDXIV) was a common year starting on Sunday of the Julian calendar. NASA’s New Horizons spacecraft will cross the orbit of Neptune after travelling for over eight years. New Horizons is scheduled to reach its mission target, Pluto, in 2015. The Scottish independence referendum will be held. The first unmanned flight test of NASA’s Orion spacecraft is scheduled to be launched. Year 1414 (MCDXIV) was a common year starting on Monday of the Julian calendar. The Catalan independence referendum will be held. A commercial cure for baldness is predicted to become available. Art and cultural property crime—which includes theft, fraud, looting, and trafficking across state and international lines—is a looming criminal enterprise with estimated losses in the billions of dollars annually. Jan van Eyck: The Just Judges. Early to mid-1800s: Burkel paints After the Hunt (c. 1830), Amalfi Cave (c. 1845), and The Horse Round-up (c.1861-1863). Vincent van Gogh: View of the Sea at Scheveningen(1882). 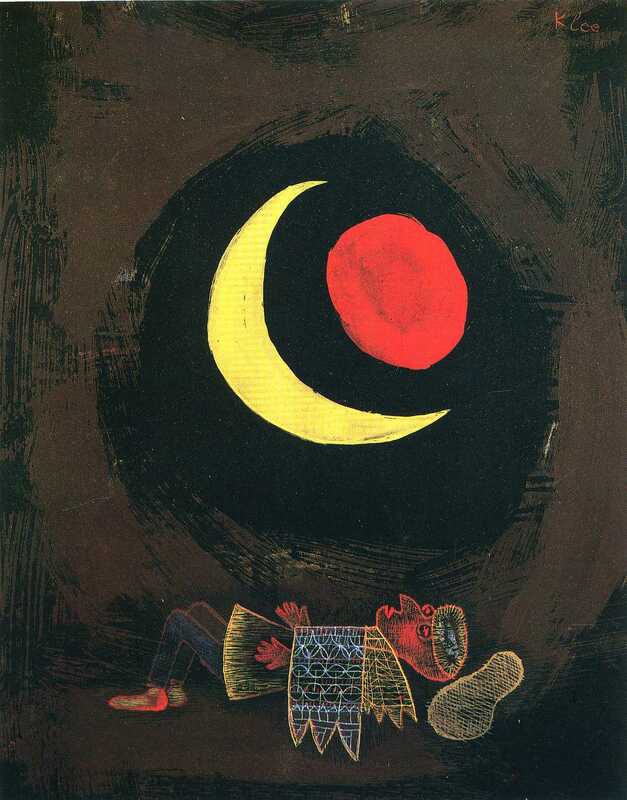 1925: All three Burkel paintings are acquired and subsequently exhibited by the Pirmasens Museum in Germany. On December 31, 1999, during the fireworks that accompanied the celebration of the millennium, a thief broke into the Ashmolean Museum in Oxford, England and stole Cezanne’s landscape painting View of Auvers-sur-Oise. Valued at £3 million, the painting has been described as an important work illustrating the transition from early to mature Cezanne painting. Johannes Vermeer: The Concert (c.1658–1660). On September 8, 2011, Madeleine Leaning on Her Elbow with Flowers in Her Hair by Pierre Auguste Renoir was stolen during an armed robbery in a Houston home. The masked robber is described as a white male, 18 to 26 years old, who weighs about 160 pounds and is approximately 5’10” tall. He was armed with a large-caliber, semi-automatic handgun. A private insurer is offering up to $50,000 for information leading to the recovery of the painting. 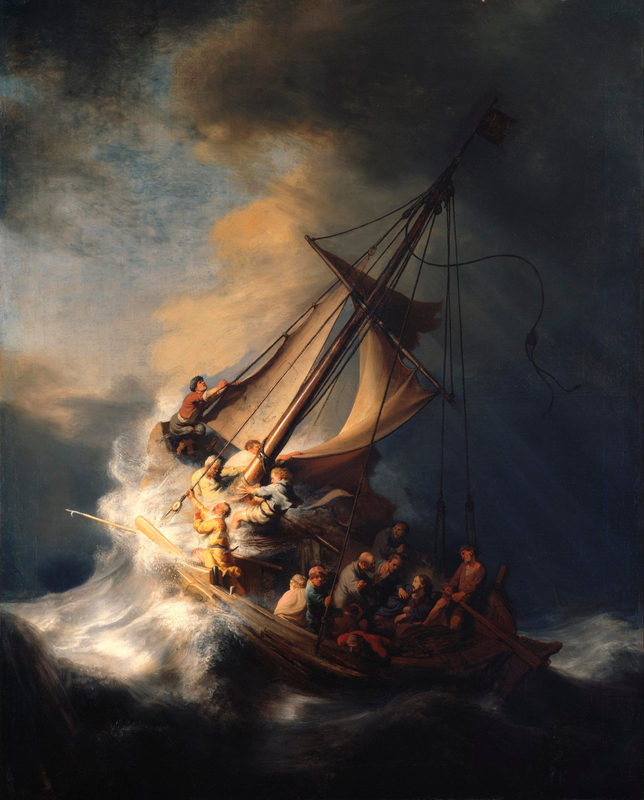 Rembrandt: The Storm on the Sea of Galilee (1633). May 13, 1942: To avoid Allied bombings, the Burkel paintings were taken to a local air-raid shelter outside of Pirmasens. Approximately 100 paintings stolen from a Florida family’s art collection in a fine art storage facility. This collection included works by Picasso, Rothko, Matisse and others that were recovered from Chicago, New York and Tokyo. Vincent van Gogh: Congregation Leaving the Reformed Church in Nuenen (1884). Radu Dogaru’s mother, hoping to free her son from prosecution, told the police that on a freezing night in February, 2013, she placed seven stolen paintings — which included Monet’s 1901 Waterloo Bridge, London; Gauguin’s 1898 Girl in Front of Open Window” and Picasso’s 1971 Harlequin Head — in a wood-burning stove used to heat saunas and incinerated them. September 19, 1945: The Pirmasens Museum reports that “about 50 paintings which had been stored in the air-raid shelter at Husterhoh School during the war have been lost during the arrival of the American troops on March 22, 1945.” The works were later smuggled to the U.S. by unknown individuals. Jean-Baptiste Oudry: The White Duck (1753). Mid-1960s: A New Jersey man purchases the Burkel paintings. How Picassos, Matisses, Monets and other precious masterpieces may have met a fiery fate in a remote Romanian village, population 3,400, is something the police are still trying to understand. Amadeo Modigliani: La Femme à l’éventail (Modigliani) (1919). Late 1980s: The Burkel paintings are handed down to the New Jersey man’s daughter. Caspar David Friedrich: Landschaft mit Regenbogen (c. 1810). October 25, 2005: The William H. Bunch Auction and Appraisal Company in Pennsylvania advertises the sale of the Burkel paintings on the Internet and through the print media. Heike Wittmer, Pirmasens Museum Director and Archivist, spots the paintings for sale and alerts German authorities. U.S. Embassy officials contact the FBI, which halts the sale and takes custody of the paintings from the consignor, who voluntarily agrees to their return to Germany. Rembrandt’s Self Portrait (1630): Recovered in a sting operation in Copenhagen carried out in cooperation with ICE and law enforcement agencies in Sweden and Denmark. The FBI had previously recovered Renoir’s The Young Parisian. 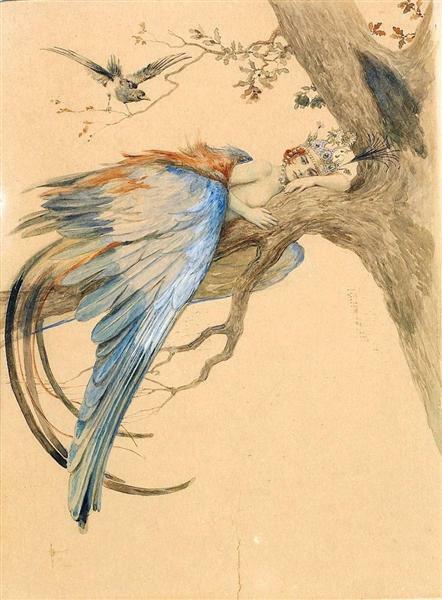 Both paintings had been stolen from the Swedish National Museum in Stockholm in 2000. February 10, 2006: The Burkel paintings are repatriated to Germany by the U.S.
Pablo Picasso: Le pigeon aux petits pois(1911). In December 2002, two thieves used a ladder to climb to the roof and break in to the Vincent Van Gogh Museum, Amsterdam, The Netherlands. In just a few minutes the thieves stole two paintings: Van Gogh’s View of the Sea at Scheveningen and Congregation Leaving the Reformed Church in Nuenen, valued at $30 million. 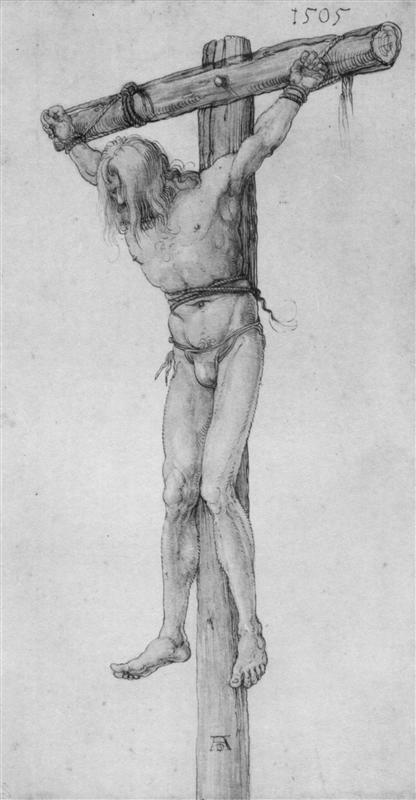 Dutch police convicted two men in December 2003, but did not recover the paintings. Forensic analysis of ash found in Mrs. Dogaru’s stove, conducted by Romania’s National History Museum, found nails and tacks that indicated that at least three had been burned. 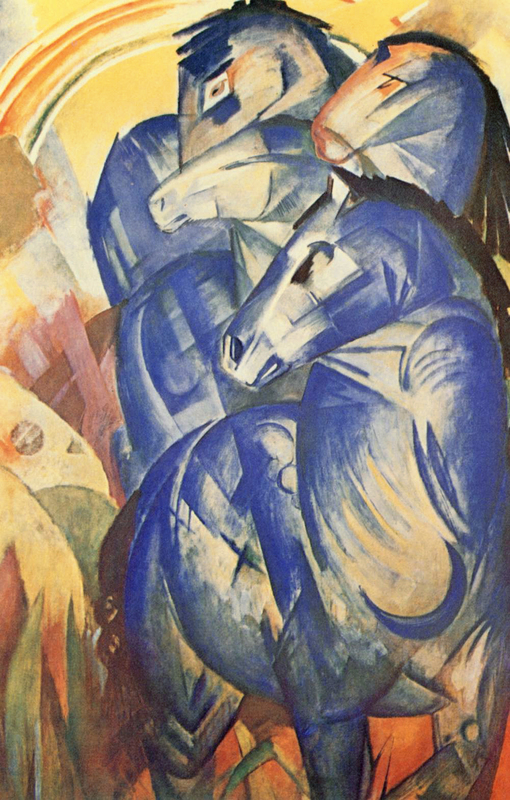 Franz Marc: The Tower of Blue Horses 1913 (missing since 1945). Carl Spitzweg: Der Liebesbrief 1845-1846 (missing since 1989). IF YOU HAVE ANY INFORMATION CONCERNING THESE WORKS OF ART OR CIRCUMSTANCES OF THESE CRIMES, PLEASE CONTACT YOUR LOCAL FIELD OFFICE OR THE NEAREST U.S. EMBASSY OR CONSULATE. Pierre Pinoncelli damaged two of the eight copies of Fountain by Marcel Duchamp with a hammer. The attacks were separated by 13 years: The latest on January 4, 2006 at Centre Pompidou in Paris. And in Nîmes in 1993. Where he also urinated into it before using the hammer. Accordingly, in our Mongolian age all change has been only reformatory or ameliorative, not destructive or consuming and annihilating. The substance, the object, remains. And the new gods come. 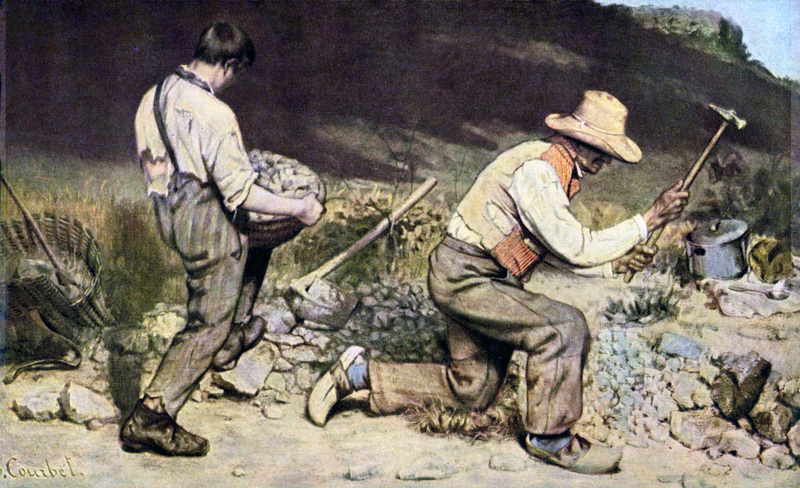 The Stone Breakers (French: Les Casseurs de pierres) was an 1849–50 painting by the French painter Gustave Courbet. It was a work of social realism, depicting two peasants, a young man and an old man, breaking rocks. The painting was first exhibited at the Paris Salon of 1850. It was destroyed during World War II, along with 154 other pictures, when a transport vehicle moving the pictures to the castle of Königstein, near Dresden, was bombed by Allied forces in February 1945. Damage then recovery, damage then recovery. Even to his death, Duchamp retained a sense of humor. The evening of 1 October 1968 had been a pleasant one, dinning at home with his friends Man Ray and Robert Lebel. Shortly after his guests had left, it happened suddenly and peacefully. Just before retiring at 1:05 A.M. his heart simply stopped beating. Courbet died, age 58, in La Tour-de-Peilz,Switzerland, of a liver disease aggravated by heavy drinking. “D’ailleurs, c’est toujours les autres qui meurent;” or “Besides, it’s always the others who die”. The eternal hourglass of existence is turned upside down again and again, and you with it, speck of dust! Antimetabole. Repetition of two words or short phrases, but in reversed order to establish a contrast. It is a specialized form of chiasmus. Epiphora. The repetition of a phrase or word at the end of several sentences or clauses. Sisyphus was son of King Aeolus of Thessaly and Enarete, and the founder and first king of Ephyra. Everything becomes and recurs eternally – escape is impossible! – Supposing we could judge value, what follows? Conduplicatio. The repetition of a word in various places throughout a paragraph. So one must be resigned to being a clock that measures the passage of time, now out of order, now repaired, and whose mechanism generates despair and love as soon as its maker sets it going? 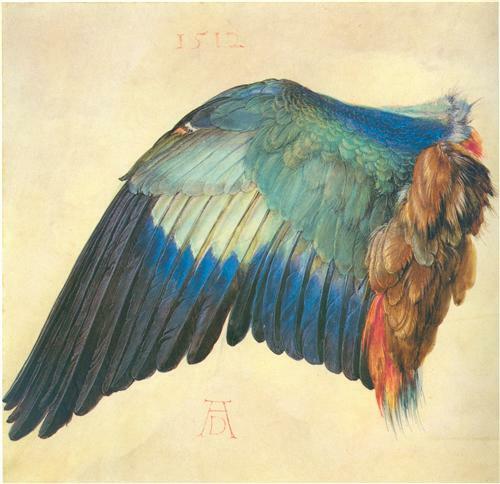 Parachesis. Repetition of the same sound in several words in close succession. New means against the fact of pain. Epistrophe. The repetition of a word or phrase at the end of every clause. Are we to grow used to the idea that every man relives ancient torments, which are all the more profound because they grow comic with repetition? Tantalus was made to stand in a pool of water beneath a fruit tree with low branches, with the fruit ever eluding his grasp, and the water always receding before he could take a drink. Anadiplosis. The repetition of the last word of a preceding clause. The enjoyment of all kinds of uncertainty. That human existence should repeat itself, well and good, but that it should repeat itself like a hackneyed tune, or a record a drunkard keeps playing as he feeds coins into the jukebox? Anaphora. The repetition of a word or phrase at the beginning of every clause. Wu Gang, known for endlessly cutting down a self-healing Bay Laurel on the Moon. Experimentalism, as a counterweight to this extreme fatalism. An art thief is a man who takes pictures. It was the blurst of times. You have a better chance of stopping a serial killer than a serial thief in comedy. I shot an elephant in my pajamas. Ducks will never hug! This devastating thought will consume my evening. I’m wild about his turnip tops. Likes the way he warms my chops! I can’t do without my kitchen man. All I leave is just the hole. He can use my sugar bowl! I’d like to give my kid an interesting name. Like a name with no vowels … just like 40 Fs, that’s his name. Just realized ducks can’t hug and now I can’t sleep. Rice is great when you’re hungry and you want 2,000 of something. Life is a four-letter word. #1: Hey, I hear you got a job as a salesman. #2: Sure did. Pays real good. #1: What do you sell? #1: Is that right? I’ll be. I sell pepper. Let’s face it, some people have a way with words. Other people, uhh . . . oh . . . not have way, I guess. I’d like to have 19 kids. I think naming them, that’s going to be fun. I already have names picked out. First kid — boy, girl, I don’t care — I’m naming it Rrrrrrrrrrrr. The funniest food: ‘kumquats.’ I don’t even bring them home anymore. I sit there laughing and they go to waste. What are three words a woman never wants to hear when she’s making love? Just realized giraffes can’t hug and now I can’t sleep. My real name is bdbdbdbdbdbd. My sister’s name was yullyullyull. You’re watching a guy do your material and people are laughing, but they’re laughing because they think this performer has a brilliant mind and he’s a funny person. Just realized horses can’t hug and now I can’t sleep. I think he sort of got some of my jokes in his head and got sloppy. It takes forever to cook a baked potato in a conventional oven. Sometimes I just throw one in there, even if I don’t want one. Cause by the time it’s done, who knows? with the brown, black, yellow and clear ones. Is a pillow bottle a disciplinary form of some metaphor? them and those without any. On the table’s edge,—is a suburb lane, / With a wall to my bedside hand. that killed Dylan Thomas ( I think that’s a record ! ). In the throat, burning and turning. roadsides, when flung from car windows. and drinking from a pint of Old Crow. Georges Simenon wrote more than 500 novels. Isaac Asimov wrote 506 novels. Alexandre Dumas wrote 277 novels. Rolf Kalmuczak: maybe 3,000 novels. More than 100 pseudonyms. Want of money and the distress of a thief can never be alleged as the cause of his thieving, for many honest people endure greater hardships with fortitude. We must therefore seek the cause elsewhere than in want of money, for that is the miser’s passion, not the thief’s. James Joyce wrote four novels. James Joyce wrote three novels. James Joyce wrote only three novels. It’s nice to sometimes get things out of life, rather than stealing from other artists. I’m trying to steal from the real people. They’re stealing my ideas. They’re imitating my shots.